As much as I hate to admit this...it is time to start thinking...dare I say it...LESSON PLANS! Scary, I know! We start back on Monday, and so I am trying to coax myself into a little work here and there! Actually, this unit was created with my husband! How cool is that?!? He is very gifted with music and writes some pretty amazing songs for his 5th grade class. So, I begged him to let me put them into my unit. We both work at the same school and have found music to be one of the most successful instructional tools. We say if our students can learn the lyrics to any rap song out there, they can learn our lyrics too. Let me just say, They. Love. To. Sing!!! Each time we begin a new unit, their first question is always..."What song are we going to learn?" What is even better than that is when you hear them whispering the songs or doing the motions during testing! That is when you know it is going to be a great day! Ha! This year, since being moved to 3rd grade, I have been able to use a lot of his songs in my classroom. As we were working through our geometry unit before Christmas, they learned "I Wanna Name My Triangles" while learning how to name triangles by their angles and sides. Mr. King won major cool points for that song! Plus, they thought it was cool that 5th graders sing the exact same song! This pack includes 14 songs that will help your students master some pretty tricky concepts. Most of the songs in this unit will be perfect for 2nd - 5th grade. 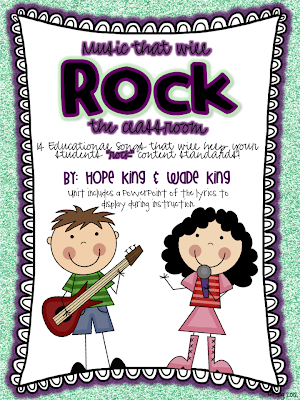 In this unit, you will find 14 songs, 14 copies of black and white lyrics for student notebooks, and a PowerPoint that includes all of the lyrics to use during instruction. Several of the songs also include dance moves or motions. Instructions are provided for these movements as well! This is definitely a unit that we will be adding to as we go! I am sure there are plenty more songs in our future! My kiddos will make sure of that! I love that your husband made this!!! I try (key word: try) to come up with songs all the time for my little first graders to help them remember things and they love it! Such a fun pack - I will certainly recommend it to some of my friends who teach older grades! What a great idea! I love all your song posts! I sing all the time with my students... they are the only ones who enjoy it... I always wanted to be a rock star, but teaching was my calling! :) Can't wait to look at these! Thanks for sharing! This unit looks fantastic! I use music alot for transitions and my kids love it. I agree, kids really remember concepts that you attach a song to. How fun that you to created this with your husband! I love all of your awesome ideas and look so forward to your blog posts! Hi there! 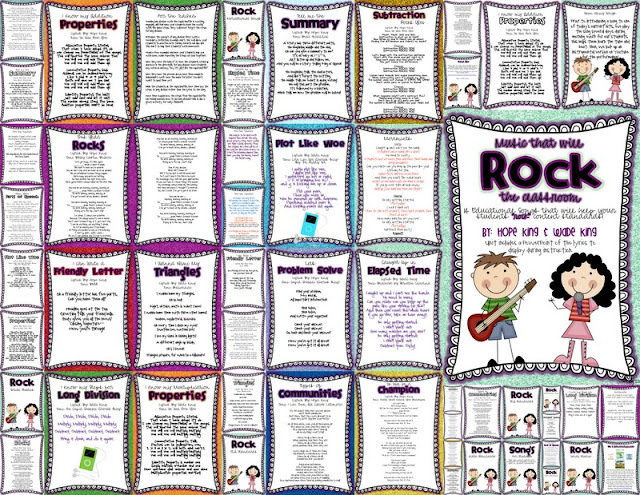 I read about your Rock the Classroom pack, but can't find it on TpT any more! I read about it on One Extra Degree, which linked to this page, but your link doesn't take you to the pack, it takes you to your store (which I LOVE)! Is the Rock the Classroom not for sale anymore? Heart Attack: A February Writing Unit!